Last Sunday's Super Bowl became the most watched TV program ever with over 106 million viewers breaking a record held for almost 30 years by the last episode of M*A*S*H (which had just under 106 million viewers). 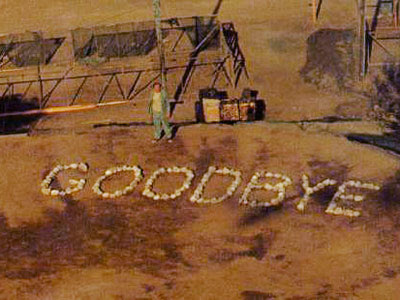 I watched the last M*A*S*H back in 1983. I watched the end of the Super Bowl on Sunday. On the one hand, there were a lot fewer TV's back in 1983. On the other, there are a lot more channels today. I get chocked up just seeing that picture. I realized last week that the New Orleans Saints are kind of like the Cubs of the NFL. But really they're better at being the Cubs than the Cubs are. Not only do they have that lovable loser aura, but after Katrina they became nearly impossible to root against. I don't think anyone other than the people of Indianapolis was rooting for the Colts on Sunday. I'm not even convinced the Manning family (Peyton included) was really rooting against the Saints. Whereas there are plenty of people who root against the Cubs. White Sox fans for one. Still, if the Cubs ever played in a Super Bowl, I bet they'd draw bigger ratings. Notice Peyton on the turf in the background. I was telling the DH that I think NO has taken over the title of America's team from Dallas. Even people in Dallas route for the Saints. I certainly was happy to see them win.